This range of high performance 5W high voltage power supplies has been specifically designed for applications where space is at a premium. These compact DC to DC converter modules operate from a dc supply of either 12V or 24V (nominal) and provide an accurately controlled high voltage output. The use of high stability components within the feedback system ensures a low temperature coefficient and good long & short term drift making the 3590 series ideal for use in many low power and portable applications. The output voltage may be controlled from 50V to maximum (2.5, 5, 7.5 or 10kV) by means of an external control voltage of 0 to +5V (or +10V to special order). Monitoring of output voltage and current are also provided as are fixed and variable references. 3590-XXX1 As above for 0 to +10V control input (NB: Fixed and variable reference are not fitted). +10.8V to +15.6V dc. No load current: 120mA at 12V i/p. Full load current: 730mA at 12V i/p. +21.6V to +30V dc. 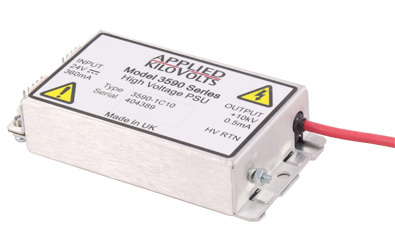 No load current: 80mA at 24V i/p. Full load current: 360mA at 24V i/p. <75ppm for a 1V change in input voltage. 2.5kV models: <1500ppm for zero to full load. Other models: <500ppm for zero to full load. <150ppm over 8 hour period, <100ppm over 1 hour. Zero to +5V, multi-turn potentiometer. Flying lead, red UL3239 un-screened 20kV cable 0.4m long. HV Return: M3 stud or fixings.